Watch out for other animals that will want to eat your pet chicken. They are frequently killed by other household pets or animals that get into the yard. Always be extremely careful to avoid having them get hurt. 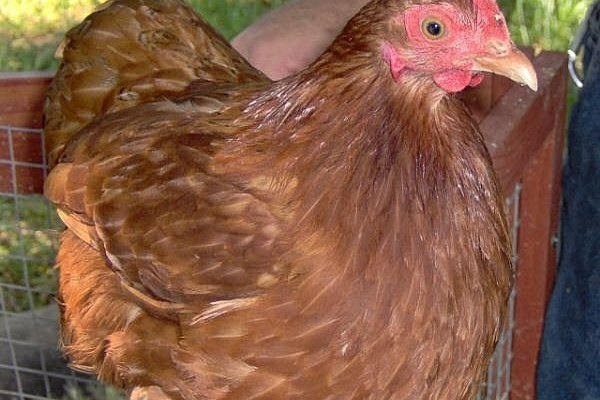 Though many people would never have considered having a chicken as a house pet, there is a growing number who love their chickens and want to spend more time with them than a relationship from house to coop will allow. 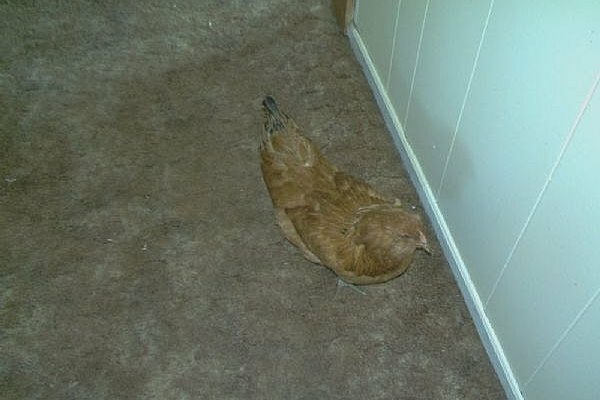 Thus chickens are more frequently than ever becoming house pets. This is really nothing new. Many families have stories of a chicken that lived in their grandparent's house and was a cherished family pet. 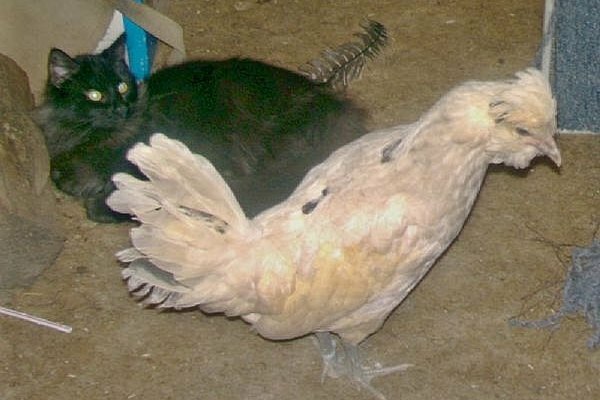 But as people realize chickens are wonderful animals, with personalities and likes and dislikes, they realize there is no reason why a chicken can't be a pet, like a cat or a dog, or the "normal" pet birds such as parrots and cockatiels. They are inexpensive, easy to care for, and even make you breakfast, but aren't right for everyone. 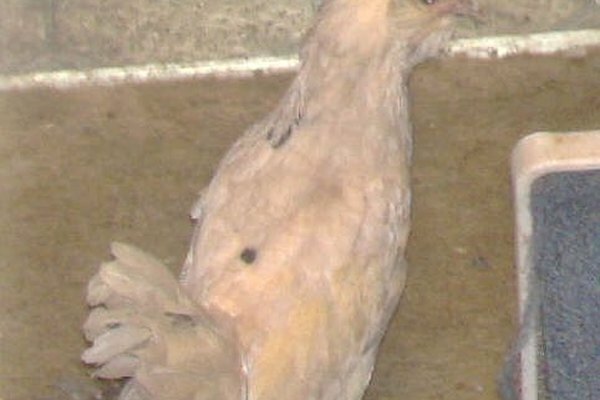 Decide if having a chicken as a pet is right for you. Chickens are not the right pet for everyone. They are messy, frequently loud, and will smell if their cage is not cleaned regularly. The same could be said for many pets though. 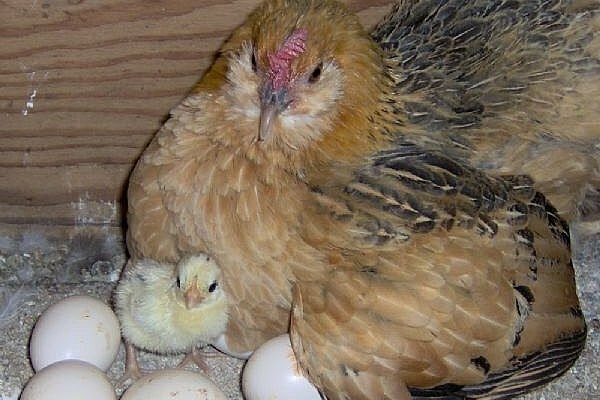 Consider whether you are allowed to have chickens in your area, whether you have the time to take care of another pet, and whether you are prepared to answer countless questions about why you have a chicken as a pet. Also, if you have other pets, decide if they might be likely to hurt your new pet. House chickens die most often from another family pet's attack, so know if your dog or kitty will hurt the chicken before deciding on getting one. Setup a cage. Chickens need a roomy cage that they can easily move around in. It should be at least 2' square if the chicken is going to be a small bantam (mini) and you plan on letting the chicken out to play during the day. It will need to be lined with wood shavings from the pet store, not pine or cedar varieties though. They'll also need a food dish and water dish, something to hang on the side of the cage is best so they don't get knocked over. Also, a small bowl for any treats or food scraps you give them, since adding them to their regular food bowl or just setting them in the cage will make a mess. Chickens appreciate a lot of food scraps and leftovers. If you plan on getting a chicken that lays eggs, the hen will need a box to do that in. An appropriately sized cardboard box works okay for this. Most chickens want some sort of perch as well. 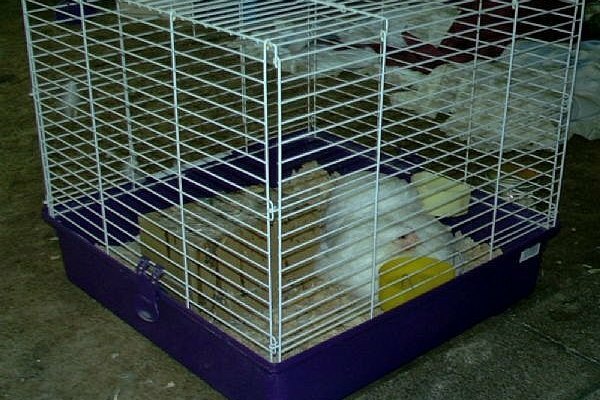 Add a bar across the cage, about halfway up for the chicken to sit on. Choose the proper chicken. Not all chickens are equal. Some are very hyper, others are calm. Some are very small, others are huge. There are males, called roosters, and females called hens or pullets. There is a lot of variety in chickens, and you want to choose the one best for your home. 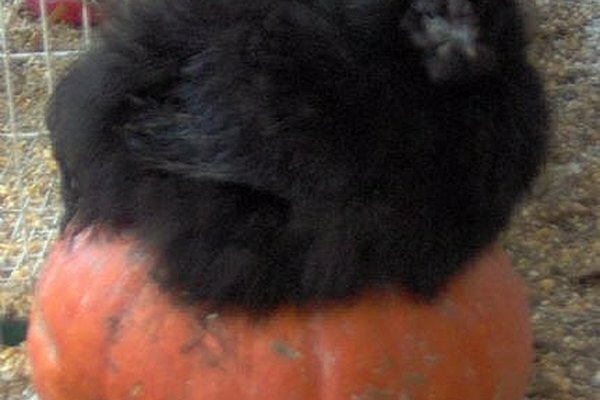 In most cases, a Silkie hen will be best. 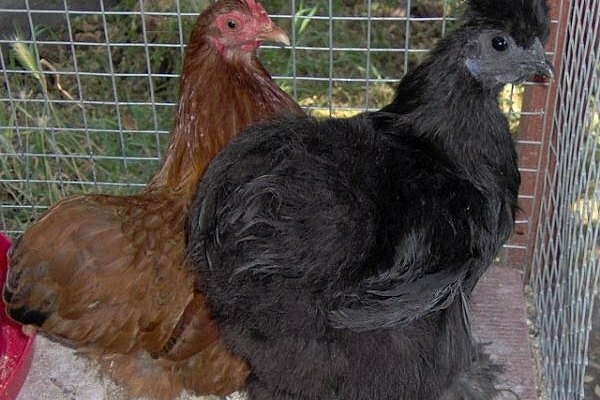 Silkies are small, friendly, calm birds, who have feathers that look like fur. Their docile demeanor makes them a great pet and perhaps is the main reason they are the most popular chicken to be a house chicken. Also, since the chicken is a hen, she will make noise, but probably won't crow, and will even lay small eggs. Be prepared for noise. Roosters are the louder chicken. They crow many times a day and are not appropriate pets for someone with close neighbors. Not only that, but they're usually banned in most areas due to their noise. Hens can be loud too though. When a hen lays an egg, she usually squawks up a storm, telling everyone of her accomplishment. Hens also make noise when they eat, find food, and just general talk sometimes. Some hens are noisier than others, but all will make noise at one time or another. Get some chicken diapers and a leash. If you're going to have a house chicken you will most likely want a chicken diaper and a leash. Chicken diapers go over a chicken's bum so when they poop, it doesn't end up on your floor. They are very similar to those used by parrot owners, though of course, larger in size. They allow your pet to truly be a member of the family, and make it more comfortable to hang out on the sofa with. They will need to be changed regularly, just like all diapers, and if you don't want to do this, a chicken is probably not the right house pet for you. A leash is necessary if you choose to take your chicken anywhere. They are usually designed to connect to the chicken diaper and allow you take your chicken outside for a walk. Feed your chicken the proper food. Feed varies depending on the age of the chicken and whether they are laying eggs, so it's important to ask about the appropriate feed at the feed store. Most hens require laying feed, either pellets or crumbles, and the wrong food can cause nutritional deficiencies. Make toys for your chicken. Chickens are intelligent animals, and as such need toys and things to occupy them. Chickens in nature spend a lot of time searching for food, so hiding some food around their pens or playing games with them and involving food are great fun for the chickies. You can even train your chickens to do tricks. Prepare a dust bath for your chickens regularly. 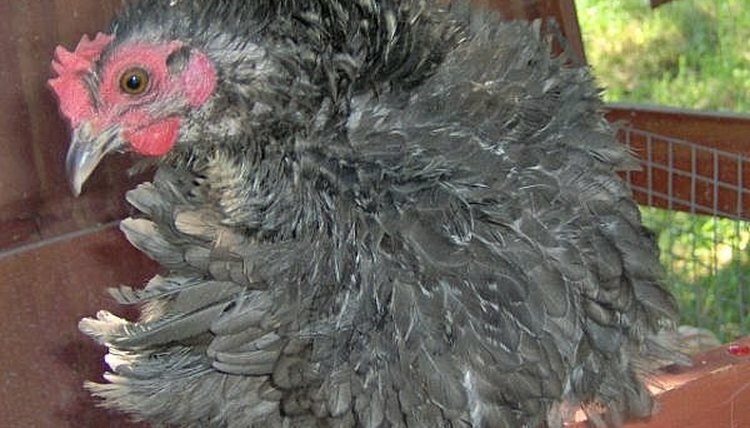 Chickens need dust baths to keep their feathers in good shape and without them can look disheveled and even have problems with bugs. Make a dust bath by getting some play sand and putting a couple of inches into a pan so the chicken can roll around in it and get it into its feathers. They will make a mess, so it's best to have the area surrounding the pan covered with newspaper for easier cleanup. Or you can make a spot outside in the garden where the chicken can roll around to her heart's content. Handle your chicken regularly. 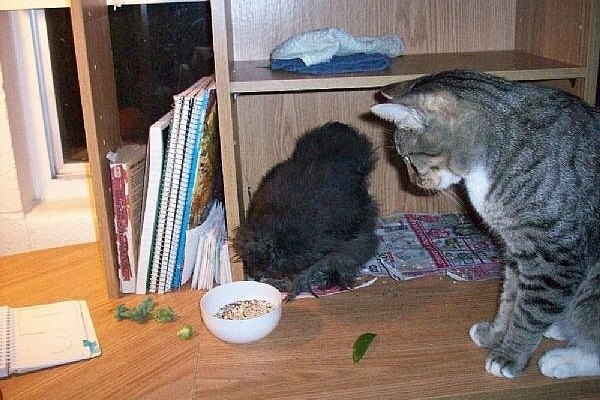 The most important part of having any pet is to handle it and play with it and give it time outside its cage. Chickens are no exception and your pet will become friendlier and more a part of the family the more you handle her and hang around her. Chickens can make wonderful family pets with love and lots of care. Why Do Parakeets Chew on Paper? Do You Need More Than One Chicken? Can Parrotlets & Budgies Live in the Same Cage? Do Chickens Make Good Pets? What Is the Difference between a Parrot & a Parakeet? Do Budgies Get Along With Finches?